i don't know what to post. 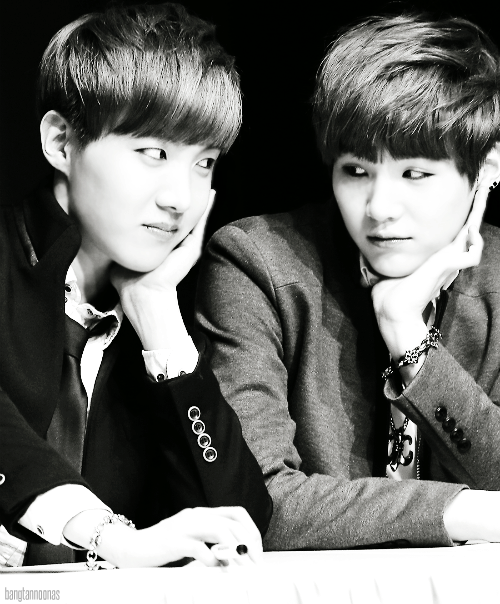 But i really like yoonseok. Hah!!! Ooooo about damn time someone made a thread for them... idk what to post lol but I look forward to this thread. Yaaay! I'm glad you made this thread. Arguably, I think they're one of the least popular ships seeing that they're having a thread just now. I really admire their friendship. I think so too.. 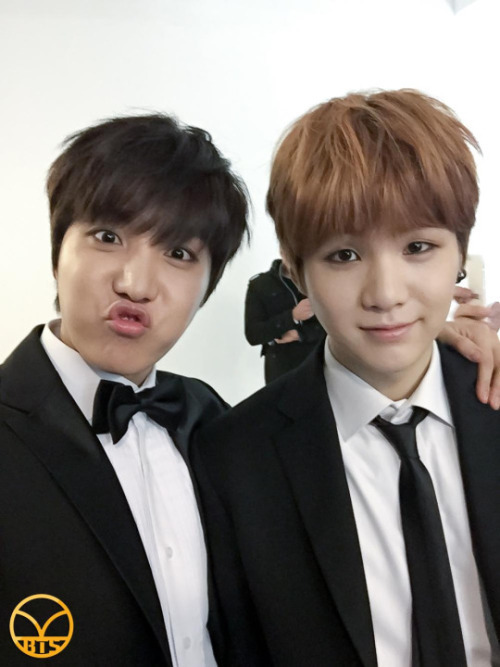 I also think that Jhope is the member that everyone's least awkward with, especially during work. Namjoon once said that when he's working with Jhope, he makes it fun and light. Sure they are the least popular ship. I think that's because they didn't really show 'that kind' of interaction. But once they did, it's really make me think they have special relationship/friendship/platonic/whatever it called. 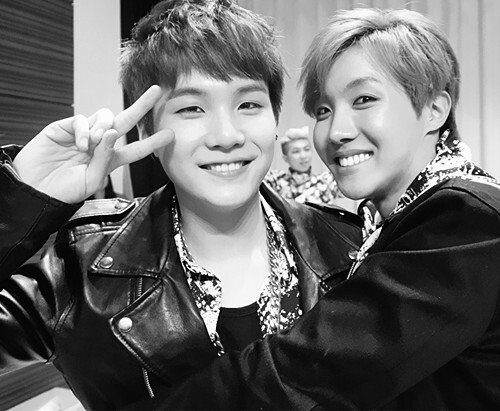 Like how hoseok became calm around yoongi and how yoongi always had big smile around hoseok. I love these 2 together following this. 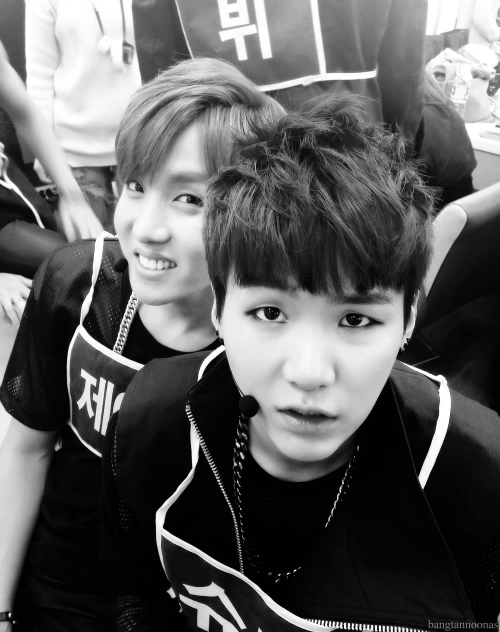 If I find any good pics or gifs I'll drop by again~ I never realized the only person Yoongi sometimes becomes touchy with is Hobi, but it's real cute. U noticed that one too??? Cool. I thought Im being delusional. Yoongi always react to hobie antic, and hobie literally like can make yoongi's life thousand much better. They fit so well. I love to see how calm hobie can be around yoongi and how crazy yoongi can be around hoseok. Did u watched their naver starcast show, when them both became mc??? I am not a shipper but i m loving their relationship! They seem to get along really well. I kinda understand why it is not one of the most popular ships. And that is because most popular ships are mainly based on the most popular "attractive" (with this I mean that the ones the majority of the fans considers the most attractive ones), and how much fanservice they give. 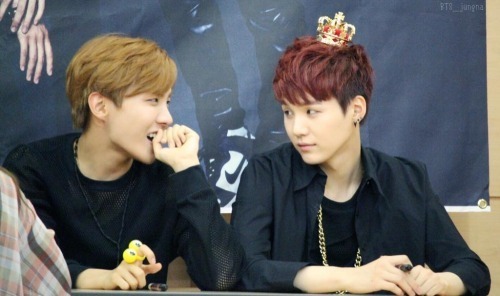 I never realized the only person Yoongi sometimes becomes touchy with is Hobi, but it's real cute. This is not true though. Suga is touchy with all of them, just way less regularly, since he is one of the less touchy members. Maybe it is more frequent with J-Hope? Maybe that is why it seems like that. But Suga just like all the others are touchy with all of them. sure, if we want a badge though, we need at least 6 supporters, and at least three ppl have to keep this award. Let be delusional together then. Haha. there’s no wrong in this pic. but, only if hoseok doesn’t make that face?!! oh... and when will we get a yoonseok badge??? i dont have a skill to do it. i'll can just helping on part of supporting and keeping. i really do wish yoonseok badge my first OH badge.